On December 8, the Catholic Church celebrates the Feast of the Immaculate Conception. 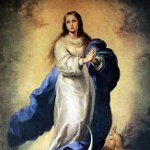 The eve of the Immaculate Conception is a public holiday in some countries, namely Guatemala and Colombia. In both countries, the celebration has some specific traditions. In Colombia it is a traditional holiday known as Little Candles' Day (Día de las Velitas). On December 7, Colombians light candles and paper lanterns to show their belief in the dogma of the Immaculate Conception of the Virgin Mary. These candles and lanterns can be seen everywhere: on porches, balconies, windows, streets, sidewalks, squares, parks. In some cities, special lanterns and candles festivals are held on the occasion. In Guatemala this day is known as Burning of the Devil (Quema del diablo). The celebration starts at six o'clock in the evening and marks the beginning of the Christmas season. Families gather outside their homes, make bonfires and burn effigies of Satan. This ritual is believed to cleanse homes from evil. The tradition of burning the devil originated during the colonial times. Over the past few years, the traditional cleansing ritual has become a matter of concern for environmentalist groups.